Miss USA 2017 was this past Sunday – did you watch it? The women that compete in this pageant are so well prepared and extremely polished, so there is so much to learn from watching the Miss USA pageant. In today’s episode, I’m going to share with you the top lessons you could learn from this year’s pageant. Thank you for your review, Rita! If you want to get your hands on the book, go to WinAPageant.com/book. Now, onto the Lessons from Miss USA 2017. Lesson #1: Success comes first, then the title. Application: Live your best life NOW. Don’t wait for the title to make’ you. Start pursuing your dreams, your career, your desires. You are designed for something great, you know that. Don’t wait to be great! Lesson #2: God’s plan is the best plan. Application: Pursue what God wants and He’ll take you on a wild adventure! Lesson #3: Share YOUR story in your answers. Lesson #4: Your personality is your selling power. Application: Be authentically human and people will be drawn to you. Lesson #5: Step into the role of Miss USA. Application: Tie your answer back to you in the role of the titleholder. Help your judges to visualize you in that title. Lesson #6: We need wonderful women in our life to straighten our crowns and be our supporters in this life. Application 1: Remain humble no matter where you are in this journey of life so others desire to be near you and support you. Application 2: Be the girl to straighten the crowns of the women around you. Lesson #7: Other people’s negativity is about them, not about you. Application: Ground yourself in the truth of who God says you are. That, my dear, is how you win a pageant. 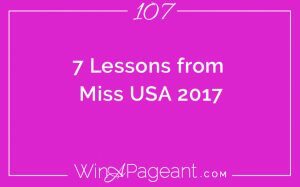 I’d love to hear your comments about what you learned from watching the Miss USA pageant. Please leave me a comment on Instagram @WinAPageant and let me know your greatest lessons. Thanks so much for faithfully listening to Win A pageant podcast every Wednesday. If you are so moved, please head over to iTunes to leave a rating and review and a comment about what topics you’d love to hear about on the podcast. WinAPageant.com/itunes will take you straight there. Super Congratulations to Miss USA 2017, Kara McCullough, and to all of the ladies that competed this month. Cheers to your success this year and every year to come!